In the prime minister’s office, no one hears you scream. 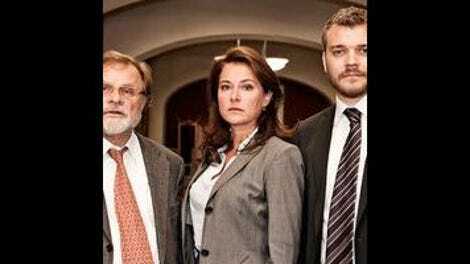 The subject of tonight’s episode of Borgen is appointing a commissioner from Denmark to the European Union’s leadership. The post is both an honor and a burden (as are most things in politics). On one hand, it can be a prestigious and powerful role. On the other hand, it can be a cover for political exile. As Birgitte Nyborg and her aides are stuck with the task of figuring out who’s best to appoint to the position, Kaspar says jauntily: “In Brussels, no one can hear you scream.” As funny (and kind of bloody-minded) that statement is, it primarily struck me as ironic. Perhaps Brussels is exile, but clearly many people in Copenhagen are in silent agony. Chief among these is Birgitte herself. Last week in “89,000 Children” we saw her break down, if only for a moment, in front of her now ex-husband. But that’s probably the first time in months that she’s allowed herself the indulgence of truly feeling whatever emotions she’s having. In the latter half of season one and in the opening of season two, Birgitte comes across as a ice queen, almost robotic in her self-denial and ruthlessness. But we know—even if no one else does—how much pain she’s going through. Though this emotional distancing has all kinds of repercussions, including her divorce, probably the best illustration of it is that she fired Bent Sejro in the final moments of season one, her best friend and adviser. I’m glad that “In Brussels, No One Hears You Scream” picks up the story of Bent and Birgitte’s friendship, because it’s an important one. Not just politically (though clearly, it is)—but also for the story of Birgitte Nyborg, human being. Especially after the events of this episode—which put Bent in mortal jeopardy—I’m beginning to see Birgitte’s relationship with Bent as a symbol, an indication of Birgitte’s relationship to her own idealism and good faith. Bent started out pushing Birgitte out of her comfort zone and into the limelight, pointing to her ambitions for doing good in a government that seemed to have forgotten the common Dane. Then somewhere in the middle of season one she started pushing him away; gradually, and then all at once. By this part of season two, she’s regularly fighting with him. He’s demoted, but he’s still a member of Parliament, so they can still run into each other in the halls. She tells him he has to make an appointment to see her, even when he comes by to say hello to her son Magnus—a particularly cold thing to do to a former friend. Birgitte’s not just distancing herself from Bent; she’s also distancing herself from everything Bent represents: the past, emotional vulnerability, and that sense of justice that led her to politics in the first place. So she demotes him and then tries to send him to Brussels and then he almost dies. Metaphor much? I wonder what would have happened to Birgitte if she had managed to send Bent to Brussels: would this part of her personality have just stayed very far in the distance while she clung to power, only to come back five years later, after she’d retired politics to return to her (nonexistent) personal life, feeling a vague sense of loss and resentment that never quite disappears? As much as she tries to divorce herself from her better angels, they’re always a part of her. Plus: She’s lonely. Birgitte needs a friend, now more than ever. She’s too clouded to see through Jacob Kruse (everyone else had his number pretty fast) and now parenting on her own, without Philip’s help. It’s better for her, for Denmark, and ultimately for us, the viewers, that Bent is going to stay in Birgitte’s life, and help her reconnect to that side of her she’d tried so hard to jettison. When Bent is desperately trying to convince Birgitte to let him be her friend again, he describes their former relationship as shoulder-to-shoulder. In the process of appointing him, they both rehearse the speeches they’ll make to the press, and Birgitte finds herself mouthing sentiments she used to feel—about how Bent is her mentor and friend, a dedicated public servant and an inspiration. It’s an embarrassing juxtaposition between the necessary image and the brutal truth—similar to that terrible TV1 interview with her husband, where they pretended to be happy. The way the moments leading up to his stroke are shot, there’s a brief glimpse of the two of them waving at a crowd together, shoulder-to-shoulder, a kind of presentiment for what is to come. Bent may not survive this embolism, which is the irony of Birgitte’s final scene with him, when she asks if they can be friends again. She might not have a chance to reconnect to this person who represents this side of herself. Kaspar and Katrine are in their own subplot this week. Due to the nature of their work they can’t help but be involved in the main story, but increasingly Kaspar and Katrine and the journalism story is a kind of shadow-narrative to complement the government’s story in Borgen. (Occasionally, the government is a shadow to the journalism story, but that’s much rarer.) I’m on the Kaspar/Katrine ship, because I’m a sucker, but this episode does a great job of showing how these two characters implicitly understand each other even when they’re doing their best to miscommunicate. Their dynamic has mellowed considerably since last season, and the addition of Hanne Holm to their dynamic makes the three of them ripe for a spinoff where they, I don’t know, fight crime in superhero outfits. Last season Hanne was one of my favorite minor characters, and it’s great to see her getting a broader role, even if everything we see is terribly sad. Her alcoholism comes back with a vengeance in this episode, but for once it seems like she might be able to reach out to Katrine instead of antagonize her. As much as I despise Michael Laugesen, he’s a great character for Hanne and Katrine to bounce off of. I hope this storyline gets more nuanced, though. Keeping him as the bad guy isn’t going to be that interesting for eight more episodes. Unlike last week’s episode, in which the political and personal elements of the show didn’t quite sync up, in “In Brussels, No One Can Hear You Scream” the two elements fit together seamlessly. The drama of politics is that power resides within people, so the personal and political overlap tremendously. The tension of Bent’s relationship with Birgitte plays out in a public arena, and the nitpicky sausage-grinding of a high-level but faraway appointment had a bottle-episode quality to it that suits Borgen well. One of the best things about this show is that it has made so many of these characters part of our understanding that as soon as, for example, Birgitte floated the idea of Pernille Madsen as the appointee, I had an opinion about it, based on our previous dealings with Pernille and what I know about the show’s version of the Danish Labour party. I don’t have that kind of recall on detail and investment for many, many political events that occur much closer to home. The show is really good at making the viewer care about these individual politicians and their little agendas. In the first season of Borgen Birgitte transformed from an idealistic, marginal politician to a powerful and competent prime minister. I find myself wondering how she will transform this season. When will all of this carefully held tension break? When will we hear anyone scream? The subtitles seem far worse this season. There are whole lines of dialogue I was missing in my screeners. Brussels is “down there” for Denmark. I guess most places are “down there” for Denmark. Over/under on how fast Kaspar’s going to sabotage his relationship with Lotte? Two episodes? Four? Season finale?